Tangerines, a variety of mandarin oranges, are a diverse type of citrus fruit that range in flavor from very sweet to tart and range in shape from egg-sized to grapefruit size. There are many different varieties of tangerines, such as clementines and mandarin oranges. Most tangerines are seedless but some hybrids do contain seeds. As compared to oranges, tangerines are smaller, contain more water, contain less acid and sugar, and tend to have red-orange peels. One small tangerine contains 40 calories and 9 grams of carbohydrate, which is fewer than typical for a single serving of fruit. Tangerines also contain 1.3 grams of fiber, contributing to about five percent of your daily needs, making them a filling food. Because of their size, it is often easy to overeat tangerines. If you are eating tangerines on their own, keep your portion to about one to two maximum, especially if you are watching your intake of carbohydrates. Most of the carbohydrates in tangerines come from healthy sugars; fructose, glucose, and sucrose. Fruits in the mandarin orange family have a low glycemic index of 47. For people who need to maintain low-carb diets, tangerines are OK to eat in moderation. 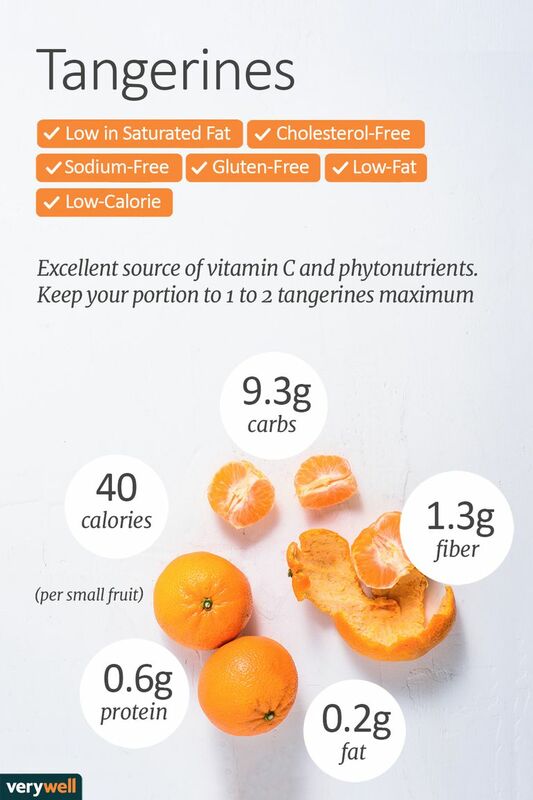 One small tangerine contains 5 percent of your dietary fiber needs. The fiber in tangerines, like many citrus fruits, is soluble, making it helpful for slowing digestion. Soluble fiber also helps stabilize blood glucose and lower cholesterol levels. Tangerines are very low in fat, containing negligible amounts of monounsaturated, polyunsaturated, and saturated fatty acids. Tangerines are fairly low in protein, containing negligible amounts of essential and non-essential amino acids, aspartic acid being the one found in the highest amount. Tangerines contain small but significant amounts of potassium, calcium, magnesium, and iron. Potassium-rich diets reduce the risk for cardiovascular disease. Calcium is important for healthy bones and teeth. Magnesium helps regulate blood pressure. Iron is important for providing oxygen to muscles. Tangerines are an excellent source of vitamin C, containing 31 percent of your daily needs in one small serving. Vitamin C is a water-soluble vitamin that is involved in repairing cells, slowing down aging, and boosting immunity. The fruit is also a good source of fat-soluble vitamin A, which is important for eye health as well as proper organ functioning. Like other citrus fruits, tangerines contain flavonoids, phenolics, and essential oils that confer anti-oxidative properties. Tangerines contain a relatively large variety and amount of phytonutrients, which can protect cells from damage, reduce inflammation, lower the risk of cardiovascular disease, and provide other health benefits. Are tangerines and clementines the same thing? No. Both are in the mandarin orange family, but they are considered unique fruits. While both are easy to peel, tangerines tend to have a tougher skin than clementines. They are also more tart. Tangerines have seeds, while clementines do not. When are tangerines in season? Tangerines are considered in season from around November to April. Clementines, on the other hand, are in peak season from October through January. Tangerines can add a lightly sweet and citrusy flavor to salads, sides, and main courses. Simply chop up your tangerines and place them in your dishes or use tangerine juice to make salad dressing. Tangerines can also be eaten alone or in combination with low-fat yogurt, cottage cheese, or ricotta cheese for a filling, fiber- and protein-rich snack. The fruit makes for beautifully presented meals, complementing food and giving it a refreshing flavor. Tangerines are a great addition to vegetable dishes, poultry, and seafood. People with citrus allergies may experience tingling, itching, redness, swelling, or even burning when touching either the skin or inside of the tangerine. Some may also experience digestive and/or respiratory problems. Tangerines do not contain furanocoumarins like some other citrus fruits and will not potentiate the effects of your medication. Stone, M., Martyn, L., Weaver, C. Potassium Intake, Bioavailability, Hypertension, and Glucose Control. Nutrients. 2016. 8(7) 444. doi:10.3390/nu8070444. Ladaniya M. Citrus Fruit. London: Academic Press; 2008.